For U.S. foreign aid, 2013 set bold aspirations against a backdrop of dysfunctional budgetary and legislative decision-making in Congress. If the U.S. government is going to drive a relevant foreign assistance agenda forward, it will have to take advantage of opportunities early next year to embed a growing list of goals within a clearer vision of how U.S. development professionals can serve a world where poverty and fragility increasingly intersect. In his State of the Union address in February, President Barack Obama sketched an ambitious target for U.S. aid engagement. “The United States will join with our allies to eradicate… extreme poverty in the next two decades,” said Obama, echoing some and foreshadowing other similar pronouncements from the World Bank, the U.K. Department for International Development and others. 2013 saw plenty of worthy causes, each of which can claim some contribution towards the extreme poverty agenda. U.S. Agency for International Development officials are looking now at what effect initiatives they have already launched — like Feed the Future and the New Alliance for Food Security — have on extreme poverty reduction. But is a general contribution to the end of extreme poverty a useful benchmark for the Obama administration to decide where to focus its political, human and financial capital? With a few noteworthy exceptions — reauthorization of the President’s Emergency Plan for Aids Relief and a U.S. pledge of up to $5 billion for the Global Fund to Fight AIDS, Malaria & Tuberculosis in particular — the administration has made more announcements than it has clear commitments backed by legislative authority. That has been due, in part, to a Congressional landscape in which routine functions can no longer be taken for granted. 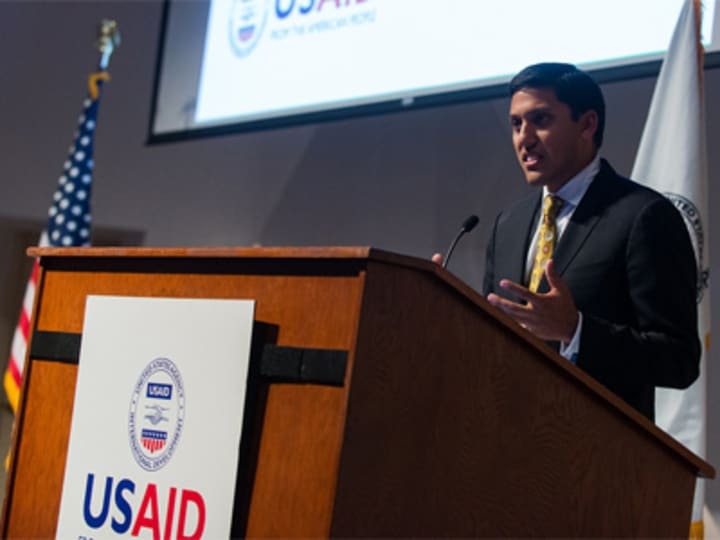 USAID Administrator Rajiv Shah made that point at the year’s final Advisory Council for Voluntary Foreign Assistance meeting earlier this month. “It is easy these days to be skeptical of any rhetoric that feels ambitious, because we’re currently celebrating the potential news that we just got a short-term budget deal, and we’re all very excited about that, but it just shows that we’ve redefined what success can look like,” he said. According to the USAID chief, the Millennium Development Goals were not seen as important at the time they were launched, but have helped galvanize support and build coalitions for development causes since. There are signs the administration and aid supporters in Congress will set their sights on more concrete achievements than “leadership ambitions” in 2014; and they will have to if U.S. foreign assistance is going to get ahead of the curve in an era of rapidly-emerging and complex crises. 2014 could see Congress pass the Foreign Aid Transparency and Accountability Act, to open data troves and make foreign assistance evaluation more systematic and more transparent. Energy poverty experts are looking for co-sponsors on the Electrify Africa Act, a piece of legislation that predates Obama’s Power Africa initiative, and which would make it easier for government agencies to support investments in sub-Saharan energy projects. USAID is planning to merge two agency offices — The Office of Science and Technology and IDEA — to create an innovations laboratory that will make it easier for “traditional” aid projects and their implementers to procure new technologies and expertise from business and academic partners. But if the administration is to move beyond an often-criticized cycle of new initiatives and one-off priorities, U.S. aid leaders will have to revisit in a meaningful and action-oriented way the overarching strategy that undergirds U.S. development implementation. The second Quadrennial Development and Diplomacy Review, which is set to begin this winter, will give the administration and its appointees a chance to do exactly that. Aid leaders need to seize upon the second QDDR to better position foreign assistance as a strategic instrument for the professional conduct of development and not a pool for “siloed” project funding that is susceptible to the whims of individual policymakers and special interests and that often creates parallel implementation channels. Aid watchers expect the second review will be more limited in scope than the first QDDR, which many feel suffered from unclear mandates and a leadership team in flux. This time around, the review is expected to focus on a narrower set of priority areas; and many observers hope it will produce a transparent plan for implementation. It should also tell a better story about the role of the development professional in U.S. foreign affairs. U.S. foreign aid spending is notoriously misunderstood. When asked, Americans overestimate foreign assistance spending levels by 20 times; and they think we should spend ten times more than we actually do. With official aid budgets in decline and with pockets of extreme poverty increasingly located in fast-changing fragile states that demand flexible and integrated programs, not one-off initiatives, the Obama administration should welcome the occasion of the second QDDR to explain why and how the U.S. government will make difficult trade-offs in its use of limited aid resources. Eliminating extreme poverty would be an historic triumph; and it may be achievable within a generation. But U.S. aid professionals could be even more effective in the service of a clear narrative that explains and secures their role as vital instruments not just of the next new initiative, but in the delivery of clear-sighted U.S. foreign policy to the developing world. How will food aid reform truly affect US shipping, agriculture?